The 1994 FIFA World Cup Final was a soccer game that took place at the Rose Bowl in Pasadena, California, United States, on 17 July 1994 to determine the winner of the 1994 FIFA World Cup. Brazil beat Italy 3–2 on penalties to claim their fourth World Cup title when the match finished 0–0 after extra time; this meant that Brazil surpassed Italy and Germany as the tournament's most successful nation. Rose Bowl stadium, the Final venue, photographed in 2018. It was the first World Cup final to be both scoreless in regular and extra time and to be decided by a penalty shoot-out. Silver Ball winner Roberto Baggio missed the decisive penalty for Italy. Brazil had previously beaten Italy in the 1970 final, marking the 1994 final as the second time that the same teams had met in two different World Cup finals, after Argentina and Germany met in 1986 and 1990. Played at 12:30 local time, this was the most recent World Cup final to be played in a broad daylight. 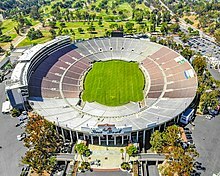 FIFA awarded the final game of the tournament to the famous college sports stadium near Los Angeles on 30 June 1992; the Rose Bowl was the largest stadium used for the tournament. The Brazilian team dedicated their win to the late triple Formula One motor racing world champion Ayrton Senna, who had died in an accident at that year's San Marino Grand Prix in Italy two and a half months before. With Italy finishing as runners-up, Franco Baresi became the sixth player in history to win gold, silver and bronze medals at the FIFA World Cup. In what was, and still is as of 2018, the only World Cup Final ever not to have a goal scored, the game would come to be defined by missed opportunities. Chances were few and far between in the first half, as Romário had Brazil's best chance of the half with a header, but he headed straight at Gianluca Pagliuca. Late in the first half, Daniele Massaro had what would turn out to be Italy's best chance of the match, as he had a good chance from the edge of the box after a counter-attack, but his shot was saved by Cláudio Taffarel. The second half was largely devoid of scoring chances, as Brazil were unable to break through the center back pairing of Franco Baresi and Paolo Maldini. 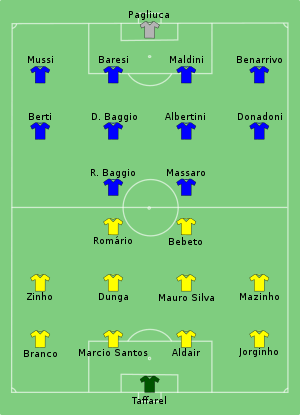 The lack of attacking play in the match was down to strong holding midfield play by Dino Baggio for Italy, and by both Dunga and Mauro Silva for Brazil. As extra time began, chances would become more plentiful, as Brazil began to dominate play. Romário had another chance early in extra time after Pagliuca made an ill advised decision to come for a cross, leaving the goal exposed, but Bebeto was unable to find him. Roberto Baggio, who had been quiet for most of the match having picked up an injury earlier in the tournament, had is only sight of goal in the entire match in the first half of extra time, hitting a shot from around 25 yards, but Taffarel pushed the shot over. Zinho had a chance on the stroke of halftime in extra time, hitting his shot well from inside the area, but Pagliuca saved well at his near post. In the second half of extra time, Romário missed a golden chance to hand Brazil the trophy, as Cafu had found him inside the six yard box. With Pagliuca at least four yards away from him on the other side of the goal, and the entire goal to aim at, the off balance Romário put his shot wide of the post. This was the first time the World Cup would be decided on penalties. Italian captain Baresi took the first penalty and blazed his penalty over the bar. Brazilian center back Marcio Santos went next, but Pagliuca saved the defender's effort low to his right. Demetrio Albertini went next for Italy, scoring his penalty into the top corner. Romário was next for Brazil, and he scored his penalty, placing it so far in the corner that it went in off the post, tying the score at 1. Alberigo Evani went third for Italy, he scored, putting his penalty high and in the middle, as Taffarel dove to the right. Branco went next for Brazil, and he scored in the bottom left corner. Massaro, who had scored twice in the Champions League Final less than two months previously, went next for Italy, but he was unable to put the ball in Taffarel's net just as he had been unable to do in the match, as the Brazilian keeper saved to his left. Brazilian captain Dunga was next, and he comfortably placed his shot into the bottom left corner, making it match point. With Italy needing to score to keep their dreams alive, talisman Baggio stepped up to take the penalty. In what would become an infamous moment in World Cup History, Baggio blazed his penalty over the bar, in similar fashion to Baresi, and this gave Brazil their fourth title. Two substitutions permitted, plus one for the goalkeeper. U.S. Vice President Al Gore, UEFA president Lennart Johansson, and FIFA president João Havelange were among those present at the stands during the awards ceremony. Vice President Gore handed the trophy to Brazilian captain Dunga. ^ "Bob Hope, California". Weather Underground. 17 July 1994. Retrieved 8 March 2019. ^ "1994 FIFA World Cup Final Details". Planet World Cup. Retrieved 11 October 2012. ^ "The Story of the 1994 World Cup". BBC Sport. Retrieved 11 October 2012. ^ a b Molinaro, John F. (21 November 2009). "1994 World Cup: Coming to America". CBC Sports (CBC/Radio-Canada). Retrieved 26 February 2015. ^ Tempest, Rone (30 June 1992). "Rose Bowl Gets Final of World Cup". Los Angeles Times. Retrieved 8 March 2019. ^ Bellos, Alex (22 April 2004). "Brazil still in thrall to the Senna legend". The Guardian. Guardian News and Media. Retrieved 26 February 2015. ^ Previously this result was attained in 1974 by five German players: Sepp Maier, Franz Beckenbauer, Wolfgang Overath, Jürgen Grabowski and Horst-Dieter Höttges.